Talking about F1: The F1 blog: Button's up? Explaining F1's strange ways to the initiated often is a trying task. One such of F1's strange ways is that if a car is under-performing an incumbent driver who really should be getting our sympathy due to having to endure the thing often in fact finds their personal reputation suffer by association. It seems that many within the sport and looking on forget the one about the challenges of making a silk purse out of a sow's ear. And rather exacerbating the effect of it is that teams often after a difficult year are minded to replace a driver (or two) as part of its response, to aid the sense of a new dawn for the following campaign. As David Coulthard - perhaps thinking of close to home experience - noted towards the end of least year, McLaren is particularly prone to such behaviour. And so the walls may now be closing in on Jenson Button. For the second year in a row McLaren is in the doldrums. More cruelly and unlike the obviously-disastrous-from-an-early-stage 2013 this season started with promise. The MP4-29 had an encouraging pre-season, featured the most interesting technical innovation in its rear suspension blockers, and of course had the apparent free pass of a Mercedes engine. Then a double podium in the first race meant things appeared firmly on the up; if the team didn't look like Mercedes it at least looked a lot more than it had in a while like McLaren. But even at that early point in the itinerary a warning sign or two had been passed. The car had seemed to slide down the competitive order as pre-Melbourne testing proceeded, and Button had bemoaned in front of media microphones and recorders that its upgrades were not as quick in arriving as was the case for its rivals. The machine in subsequent rounds revealed itself quickly to be fundamentally short of downforce - F1's very own key determinant - as well as poor in high speed direction changes. Even its blockers were a red herring - others experimented with their own versions and concluded that the resultant drag outweighed any benefit. Now the Woking squad has the partial ignominy of being the lowest placed Mercedes team in the constructors' table, behind even the far less handsomely resourced Force India. In the early part of the Silverstone weekend just passed Button had to fend off talk of his performance and future, with Ron Dennis's he needs to 'try harder' and is getting a 'wake up call' from his young team mate Kevin Magnussen comments ringing in most ears. As ever Jenson played it with a straight bat, even adding in the odd flourish. But it wasn't new; for a few weeks now Button has had to confirm repeatedly that he has nothing he can tell us on his 2015 whereabouts as well as that it is barely concealed these days that McLaren is looking elsewhere for its line-up for next year. While Spanish publication Marca went as far as to claim that Button's had it confirmed to him already that he's out for next season at Woking, though the team vociferously denied this. And it can be traced back to before this season too, with murmurings having McLaren less than thrilled with his 2013 driving also, the team suspecting that in a disappointing car and without Lewis Hamilton on his case he'd taken it all down a notch or two. That Sergio Perez - who in the main wasn't with Button on pace or results - was ditched within a year was thought to be as much an indictment of Button as of Checo. It all seems rather harsh on Jenson, as he rather appears the least of McLaren's problems right now. We are all well aware of Button's strengths and relative shortcomings as a driver. We know that his operating window in terms of handling is fairly narrow. But we also should know that when he's happy with what's underneath him he can be devastating, to the point that Ross Brawn of all people in early 2009 reckoned no driver that he had worked with had ever got so much out of his car (and think about some of the drivers Brawn's worked with), while Patrick Head - not one given to fulsome praise - likened some of Button's drives in his debut year in 2000 to those of Alain Prost. Also even in this difficult last season and a half it is hard to cite many errors from him, when he's binned it out of frustration. Few rival Jenson on race craft even now. Reflecting these attributes, while the view within the McLaren team over the past two campaign towards Button is one of vague disappointment he's still comfortably outscored both of his young whipper-snapper team mates in this time. In 2013 he beat Sergio Perez by 73 to 49, while at the time of writing he's also this year out-stripping Magnussen about as decisively by 55 to 35, and his run to fourth - nearly third - at Silverstone last time out also underlined that he's not lacking in pace or spirit. He even rebuffed Alonso for several laps, which drew admiring words from the Spaniard. The qualifying match up with both of his recent team mates is more even but that's not for a while been Jenson's forte. After all he only has had one pole position to his name since Monaco in 2009. Before these campaigns he of course kept Lewis Hamilton more than honest. Perhaps it's a matter of demeanour. Button as we know is all easy charm and even temperament. These are very much to his credit and to his benefit, but perhaps on some level it works against him. When a team's up against it perhaps such an even keel appears somehow not right; incongruous. Throwing the odd helmet across the garage to some seems more appropriate. Unfair of course. But that's not to say it's not a factor. Perhaps that his driving is a lot like him - all consistency and smoothly ghosting into good places rather than ostentatious power slides and elbows-out dicing - doesn't help in this regard either. The there is the matter of Button's age. Another thing that Button has had to bat away this season is whether his retirement is around the corner. Up until fairly recently 34 - as Jenson is - was no age at all for an F1 driver. Indeed it shouldn't be now, as these days especially there's no reason at all that Button cannot carry on for another five or six seasons. But that's not the F1 we live in, wherein you are either moving up or moving out (or bringing a load of cash), and thus the average age of the pilot has dropped. Now, only Kimi Raikkonen on the grid is older and he appeared to place an expiry date on his career during the Silverstone gathering. McLaren in the drivers' market appears to be aiming high, with the overtures to Fernando Alonso by now well-established, and some reports linking the outfit with Hamilton and Sebastian Vettel too. The team also, barring disasters, presumably is committed to its own protege Magnussen in the medium term at least. But still, short of a grand falling out with their current teams it's hard to see how any of the mentioned revered names would throw their lot in with McLaren right now, given how the outfit has persistently disappointed lately. And if they don't there doesn't seem too many glaring step-ups on Jenson available. But that doesn't make Button a shoo-in. Romain Grosjean's name has also been mentioned. We know that he's quick and towards the end of last year showed plenty of signs that he was turning the speed into consistent performances and results. This year in a recalcitrant Lotus he's been impossible to judge (ironically enough, a lot like Button has in his last two seasons). The man himself has made it clear that he's ruling no move out for 2015, plus now McLaren racing director Eric Boullier happens to be his manager too, which can't not be a help. 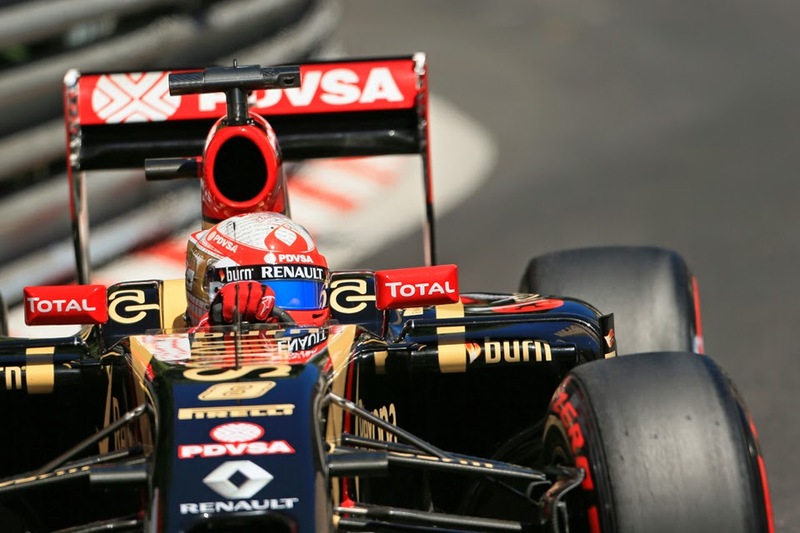 But then again Lotus has just confirmed the Mercedes engine for itself for 2015, which may be enough to convince Romain to stay where he is. David Tremayne pointed out on TV that also a Grosjean-Magnussen pairing looks one a little short on experience. Nico Hulkenberg looks an even better bet - having won admirers left, right and centre in recent times - and now that there has been a management shuffle McLaren won't have to worry so much about going cap in hand back to a driver it rather conspicuously rejected before under Martin Whitmarsh's stewardship (on the absurd grounds of the weight issue - which should be less of an issue in 2015 thanks to reg changes anyway). On the flipside from McLaren's point of view, if Ferrari goes back to the future and 'parks' Kimi Raikkonen for a second time then you'd imagine the Hulk will be right back on its wishlist. Jenson may therefore win out on the 2015 ride thanks to a sort of Dutch auction. Yet the stakes are high for Button as if McLaren does drop him it's not immediately clear where he in F1 can go. We these days have as intimated a drivers' market rather obsessed with money and youth and Button would find himself walking around the landscape not big on either. He'll rely as Felipe Massa did 12 months earlier on finding a midfield team that via circumstances is able to all of a sudden be able to pick based on talent and experience. Whether he gets that lucky is far from certain. One hopes it doesn't come to that. If he does go its not like he hasn't had a good innings is it?! Yes, 15 years isn't too bad is it? But still, it strikes me that it'd be a bit ahead of time. Button is as competent as they come, but he lacks panache. And from a marketing/entertainment perspective, he is a little too vanilla. He doesn't get people thinking and talking about him. I think that is possibly a bigger issue than his performance on the track. He simply doesn't have that star power. McLaren probably feels that a brand with their rep and history needs a real star, and Button isn't quite that.